Based on reviews from 29 experts and 81 users. Learn how our rankings work or see our guide to Chris Paul basketball shoes. Updated Apr 2019. After 12 seasons, Chris Paul remains to be the most technically sound and well-rounded point guard in the NBA today. He sets the standard with his unselfish play, skilfull ball handling, high basketball IQ, and creative playmaking ability. His never-say-die attitude and capacity to make his teammates better establish him as one of the greatest point guards of all time. His stellar career continues to belie the mythical pure point guard. He is a four-time Assists Champion and six-time Steals Champion. He was selected to eight All-NBA, nine All-Defensive, and nine All-Star Teams. He was also recognized as the 2012-2013 All-Star game MVP. But even before setting foot in the NBA and winning all these awards, Chris had already accomplished the most important feat of his basketball career. Nicknamed CP3 by his family, Chris Paul is the second child of Charles and Robin Paul. His father taught him and his brother C.J. the fundamentals of football and basketball. Chris excelled at both but decided to follow his older brother’s lead and stuck with basketball. Standing just a little over five feet tall during his freshman year at West Forsyth High School, he was considered too short and weak to match up against bigger and stronger opponents. He spent two years playing for the Junior Varsity team where he impressed with his speed and intelligence. He eventually made the varsity team during his junior year thanks to a few growth spurts. With averages of 25 points, 5.3 assists, and 4.4 steals per game, he led West Forsyth to the state semifinals and quickly became a top college prospect. Every ACC program wanted him, but he had already set his mind to joining Wake Forest. He made an oral commitment to the university and officially signed with the school during his senior year. His grandfather and best friend Nathaniel “Pappa Chilly” Jones beamed with pride during the signing ceremony and put a Wake Forest hat on his grandson’s head. However, tragedy struck less than 24 hours later. Pappa Chilly was found slain outside his home in Winston-Salem. A gang of teenagers robbed, beat, and left the 61-year-old man to die at his carport. Woebegone, Chris secretly hatched a plan to honor his grandfather in his next basketball game - one point for each year of Pappa Chilly’s life. He kept his grandfather in his mind throughout the game. Staying within the flow, he put up 32 points in just the first half and soon tallied 59 points with less than two minutes left. "I think I heard some of the children talk about it, but I didn't believe them," Robin Paul said. "I mean 61 points, come on. That's just almost unreal, so I didn't believe it." With the goal within reach, Chris drove to the basket, took the contact and made the shot. "And I laid it up, and I got fouled, and it went in," Chris describes. "And I lay there for a second and was just overwhelmed because I knew that at this moment in time, this is something I'd never forget. Ever. It just felt like I could have died and went to heaven right there." He was just six points shy of the state record, but that didn’t matter, 61 did, and he had it. "I walked to the free throw line, he gave me the ball, and I shot an airball right out of bounds," Paul said. "And my coach took me out. I just looked at my dad and started crying." 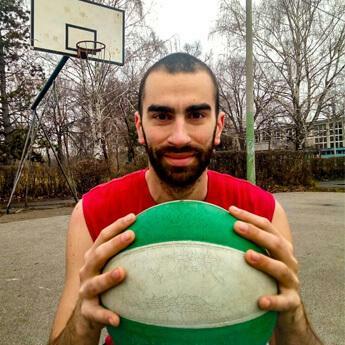 This memorable on-court moment helped him cope with his grief. "I believe it makes me stronger, but it's so hard because... we're still getting through it," Chris explains. "My granddad did so much for our family that it's unreal. It's hard to go on right now... I'm thankful for my granddad, and I'll never forget him. Ever." He led his team to the 4-A Regional Finals and ended the season averaging 30.8 points, 5.0 rebounds, 8.0 assists, and 6.0 steals per game. Chris continued to showcase his impressive skill set during his freshman year at Wake Forest and was named the ACC Rookie of the Year. By the end of his sophomore season, he had nothing left to prove and declared for the 2005 NBA draft. He was selected fourth overall by the New Orleans Hornets (renamed the New Orleans Pelicans). By the end of his rookie campaign, he was recognized as the 2006 NBA Rookie of the Year. Shortly before the 2005 NBA Draft, Chris Paul originally signed a four-year endorsement deal with Nike that was approximately worth $600,000 a year. However, his partnership with Nike did not last. During his rookie season, he was hand-picked by Michael himself to join Nike subsidiary Jordan Brand because of his undeniable talent, strong work ethic, and leadership skills. To make his move to Team Jordan official, he signed a six-year deal with Jordan Brand back in 2006. "It's huge," Chris said of his contract with Jordan Brand. "That's the best player to ever play the game. I think it's a tremendous honor to wear the shoe." The details of his contract were undisclosed, but one can speculate that a signature line was part of the package because in March 2008 Jordan Brand released his first signature shoe. Chris is one of the few Jordan Brand athletes who was given their signature line. He joins an elite club that counts Team USA regular Carmelo Anthony and Russell Westbrook as its members. With the release of the eleventh iteration of his signature Chris Paul shoes, he has also joined a rare group of basketball players who have more than ten signature models. Let us take a quick look at his thriving Chris Paul basketball shoes collection. Jordan CP3.I. Shortly after joining Team Jordan, Chris Paul’s first signature shoe was launched. “When designing the Jordan CP, we collaborated with Chris to create a shoe that best represents his game and his life,” Jordan Brand Senior Footwear Designer Jason Mayden said. “The Jordan CP is the perfect blend of style and high-performance, a reflection of Chris while he is on the court and a tribute to his life off of it.” Personal touches include the number 61 inscribed on the shoe to pay tribute to his grandfather. In the inner tongue, the letters “SP” are stitched in memory of his college coach and mentor Skip Prosser. 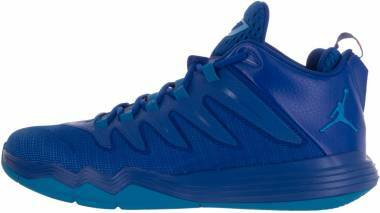 High-performance technologies are also featured in these signature Chris Paul shoes. The Jordan CP3.1 comes with ventilated ankle areas for enhanced breathability, contoured heel lining for increased comfort, and segmented outsole pods for flexibility. Jordan CP3.II. After just four years, Chris has already established himself as one of the premier points guards in the NBA. His playing style heavily influenced the Jordan CP3.2’s design. “Chris’s quickness is his most deadly weapon,” said Jason Mayden. “When he has the ball in his hands, he is like a high-performance motorcycle among a group of slow-moving cars. We designed the CP3.II with that in mind and created a shoe that is versatile enough to withstand the rapid changes of pace, the break-neck speed and the pinpoint agility of Chris Paul’s style of basketball.” Key technologies of these Chris Paul Jordans include forefoot Zoom Air, a Nufoam padded collar, and DHIP foam in the heel. These signature Chris Paul basketball shoes also incorporate personal elements to honor his family and friends. Jordan CP3.III. A new cushioning technology was introduced in the Jordan CP3.3 to keep up with Chris’s lightning-fast moves on the court. “We’re constantly working to develop new technologies that complement Chris’s advancement in the game of basketball,” Jason Mayden said. “The performance elements incorporated in the JORDAN CP3.III will only enhance his explosive, agile, and fast style of play.” Podulon is an innovative cushioning system that is designed to maintain comfort and responsiveness. “The JORDAN CP3.III is my most comfortable basketball shoe yet. Not only does this shoe have incredible performance benefits, but I also love the way its design represents me and the people most important in my life,” Chris said. Jordan CP3.IV. Chris’s quickness on the court has inspired the evolution to his fourth signature Chris Paul Jordans. 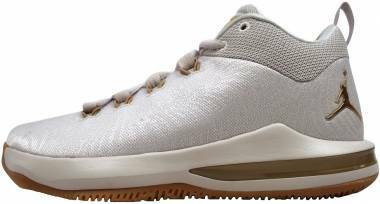 In addition to the Podulon cushioning system, the Jordan CP3.4 shoes are also constructed with lightweight synthetic materials for increased support and breathability. Each shoe’s asymmetrical collar is fashioned after the Air Jordan XIII Low’s, which is Chris's favorite Air Jordan release. Completing the shoe’s silhouette are special design elements that honor his past. 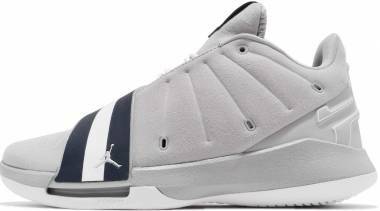 Jordan CP 2’Quick. 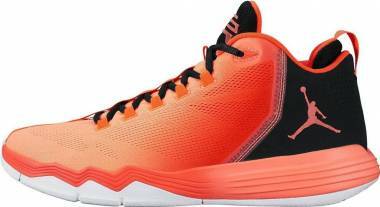 The Jordan CP 2’Quick is a pair of low-top Chris Paul shoes that are engineered to match his superior on-court performance. It features Podulon cushioning, an external heel cage, and a honeycomb traction pattern. Jordan CP3.V. The fifth in the series of signature Chris Paul basketball shoes are custom built for his distinct high-speed style. The Jordan CP3.5 is constructed with next-generation Flywire for lightweight support. Podulon combined with Phylon and Cushlon provides unrivaled responsiveness. Jordan CP3.VI. Designed after his quick and elusive game, these signature Chris Paul shoes boast the most advanced materials for ultralightweight breathability. Podulon in the forefoot offers responsive cushioning while strategically placed flex grooves enhance flexibility. Jordan CP3.VII. Engineered for speed, these Chris Paul basketball shoes feature Podulite cushioning, Nike Zoom Air, herringbone traction, and dynamic Flywire. “CP is one of the quickest point guards in the game,” Jordan CP3.7 designer Justin Taylor said. In keeping with the need for speed theme, Taylor included design cues from sports cars. These high-performance basketball shoes have perforations on the quarter panel that mimic air flow while the toe is styled after a sports car’s shifting pattern. Completing the sports car theme are VIN-inspired digits on the shank plate that pay tribute to his children. Jordan CP3.IX. Chris has consistently demonstrated that he can dominate the competition with his on-court quickness and control. The ninth pair of signature Chris Paul shoes are packed with performance-driven technologies to keep up with his aggressive style. It boasts a nine-chambered Zoom Air unit, an innovative web-lacing system, a full-length internal bootie, and a composite mesh upper. Jordan CP3.X. These signature Chris Paul basketball shoes incorporate two key points: performance innovation and ties to his family. “There comes a point when you’re like, alright, let’s flip the switch and do something different. And 10 seemed like the perfect time to do that with it being a milestone occasion,” lead designer Justin Taylor explains. “CP wanted to be different. We wanted to be different. 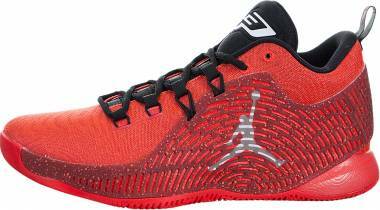 We all wanted to breathe new life into this model.” The Jordan CP3.X features a new dual pulley system coupled with support wings for enhanced lockdown. Signature details include different symbols that represent his family and accomplishments on the court. Jordan CP3.XI. Chris Paul has been heavily involved in the process of designing his signature shoes. “I’ve been doing this for a number of years now, and after learning about all of the tech and as I’ve gotten older, I now want my shoe to get lower and to be wearable right out of the box,” he explains. “Now, everything is about speed and traction.” The latest signature Chris Paul shoes–the CP3 11–feature an adjustable lockdown system, heel and forefoot Zoom Air bags, a TPU plate, and modified herringbone traction. While LeBron and Kobe have Elite versions, Chris also has Artisan Editions (AE) of his signature Chris Paul shoes. These playoff-ready versions of his signature Chris Paul basketball shoes feature performance-oriented updates to meet the demands of the postseason. Chris Paul is one of Jordan Brand’s most involved athletes in the design process. He knows exactly what he needs and refines the shoe to fit his current game. Working with him are the innovative Jordan Brand designers who are more than capable of bringing his vision into reality. Jason Mayden. A graduate of Industrial Design at the College of Creative Studies, Jason Mayden was Jordan Band’s first design intern. He spent 13 years with Nike/Jordan Brand, rising through the ranks and eventually becoming Jordan Brand’s Senior Global Design Director. He was directly involved in creating innovative products for Michael Jordan, Chris Paul, Russell Westbrook, and Carmelo Anthony. After his tenure with Nike/Jordan Brand, he co-founded Super Heroic after a heartfelt talk with his son who was having weight issues. Tom Luedecke. Tom finished Industrial Design at the Academy of Art University. He was a senior designer at Nike/Jordan Brand and worked on several projects including the Air Jordan 2011, Air Jordan 2012, and several of Kobe Bryant’s signature shoes (Nike Zoom Kobe IV, V, VI, and VIII). After spending nearly ten years with Nike/Jordan Brand, he moved to Under Armour and is currently their Design Director for Footwear Innovation. Andre Doxey. Andre took up Industrial and Product Design at the Cleveland Institute of Art. He was a global senior design director for Nike before his move to Adidas. Justin Taylor. As a senior footwear designer, Justin currently leads the design of Chris Paul shoes and Blake Griffin’s on-court footwear. He finished Art/Graphic Design at the University of Central Arkansas. To honor the people who have contributed to his success, Chris has always incorporated personalized details into his signature Chris Paul shoes. These hidden nods celebrate his faith, family, and friends. Over the years, his tribute to his family has appeared in different forms, but the ones listed below have been a staple throughout his signature line. 61. Chris Paul’s grandfather was 61-years old when he was slain. SP. These are the initials of his former coach and mentor Skip Prosser. Chevron-shaped accent. Chris Paul’s grandfather was the first African-American to own a Chevron service station in North Carolina. Jordan Brand has been releasing Chris’s latest sneakers during the months of January, March, April, September, October, November, and December. Some models actually overlap and are released within the same year. If we take a closer look, we can see that most of the releases occur towards the beginning of the new NBA season (September, October, November, and December). This strategy makes sense since brands and signature athletes would want to sport their latest and greatest basketball shoes during the full stretch of the season. If a signature athlete's team makes the Playoffs, brands also expand their signature line by releasing updated versions like the AE and Elites before the postseason begins. Jordan Brand has had some challenges in moving the products of their signature athletes. Despite having more than ten models each, Chris Paul’s and Carmelo Anthony’s signature basketball shoes tend to be overshadowed by Michael’s new and retro Air Jordans and other fashion sneakers. Their shoes are also not as popular and sought after as LeBron’s, Kobe’s, Kyrie’s, and even Curry’s signature basketball shoes. Because of this, retailers apply discounts on their shoes to move the products. The Jordan CP3.XI is also set to release in April 2018 so expect to see more price cuts on the previous models of his signature Chris Paul shoes. Why is Chris Paul called CP3? Chris Paul’s nickname is CP3 because he, his father, and his older brother all share the C.P. initials. Is Chris Paul also a professional bowler? Chris Paul is an avid bowler however he does not compete professionally. He does own a professional bowling team. He founded the L.A.X., a Los Angeles-based team which competes at the Professional Bowlers Association (PBA) league. Is Chris Paul the president of the NBA players union? Chris Paul was initially elected as the president of the Nation Basketball Players Association (NBPA). In 2017, he was re-elected to serve another four-year term. How tall is Chris Paul? Chris Paul is exactly 6 feet tall. Can I customize Chris Paul basketball shoes? Yes. Several models are made available for customization on NIKEiD.